First, break three or four eggs into a small bowl and beat them for a long time with a fork, gradually adding a small amount of milk (perhaps a couple of tablespoons) and water (perhaps a single tablespoon) into the mixture until it becomes pale and very frothy. At this point, go ahead and grate up approximately one large handful of Cheddar cheese and proceed the beat the cheese right into your egg mixture using a fork. Next, drop one large handful of fresh baby spinach leaves on top of your fried onions. Give the vegetables a quick mix, wait a few seconds until the spinach leaves begin to wilt, and then immediately pour the bowl of cheesy egg mixture into the frying pan. Now, wait a short time, perhaps forty-five seconds to a minute, until the egg mixture begins to heat up and coagulate. Take a flat spatula and start chopping and mixing the swiftly-scrambling egg as quickly as you can, in a clockwise motion, pushing the eggs around with the spatula from the outside in, until the spinach, onions and cheese are well-mixed and visible throughout the contents of the pan. Turn the scrambled eggs out into a large plate or bowl and serve alone or with toast and your choice of jam. Sprinkle with salt and freshly cracked black pepper to taste. This isn't exactly the most healthy of breakfasts, but it's nice to eat every once in a while, as it gives you a good amount of energy for hours to come. It's important not to add too much milk or water to the eggs before you scramble them (no more than two tablespoons of each liquid), because too much excess liquid, namely water, might not cook out of the scrambled eggs before they're finished cooking, and then you'll be saddled with a soggy breakfast. However, the right amount of milk and water slightly stretches the amount of the beaten egg mixture itself makes the scrambled eggs especially light and fluffy. 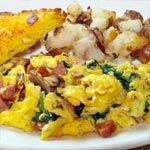 If you like reading about scrambled eggs, this recipe submitter wrote very, very detailed instructions to make this scramble. Mr Breakfast would like to thank Raakel for this recipe. What do you think of Cheesy Scrambled Eggs with Onions and Spinach? We liked it. But it made like 3 servings, not 5. I also had half of a green pepper to use up, so I chopped that and added it with the onions. Good way to use up any left over spinach in the fridge!